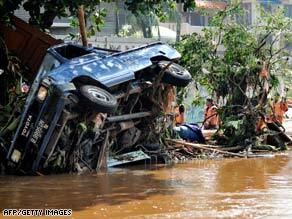 JAKARTA, Indonesia (CNN) -- The death toll from a flash flood in Indonesia's capital grew to 98 people on Sunday as rescuers widened their search for more than 130 other people in the aftermath. Members of a search and rescue team look for bodies near Jakarta. The nation's health ministry said 62 women, 31 men and three students had been killed. Of those, 12 bodies remained unidentified, ministry spokesman Rustam Pakaya said. Another 13 people were missing. The search for the missing will be called off Sunday night, he said. The flood started Friday morning after heavy rains caused waters to smash through a dam and rush into Jakarta. The breach unleashed a torrent of water that plowed into hundreds of homes in what some survivors described as a suburban "tsunami." About 1,500 volunteers -- mostly students from two flooded universities in Jakarta -- are assisting in the search and rescue effort, said Mardjito, a social affairs ministry official who, like many Indonesians, goes by one name. He said rescuers started using heavy machinery to lift debris. Still, the death toll is expected to rise. At least 50 people were injured and nearly 1,500 have been displaced. Mardjito said a camp for survivors so far has adequate supplies as members of political parties continue to send food, blankets, flashlights and other items amid a major election year. Drenched and shivering survivors were taking refuge on the rooftops of their homes as rescuers in rubber boats were struggling to reach them, said social affairs ministry official Mardjito. Indonesian President Susilo Bambang Yudhoyono, currently on the campaign trail ahead of the elections later this year, has said he had ordered senior ministers to visit the scene of the disaster. "On behalf of the government, I express my condolences to the families of the dead victims and may their souls be accepted by God almighty," he said, according to the official Antara news agency. The rain obliterated a 255-meter-long section of the dam, releasing a wall of water from a 20-hectare lake that some survivors said reminded them of the tsunami that hit Indonesia in 2004. "They said they had heard loud rumbling sounds like during a powerful earthquake. They later found out that the sounds came from the water rushing out from the dam's lake," according to Antara. Floods from heavy rains are an annual occurrence in and around Jakarta, a low-lying city on the northern coast of Java island, where poor infrastructure often results in polluted canals and rivers overflowing their banks and spilling into thousands of homes. In 2007, 38 people were killed and 430,000 forced from their homes when storm water 3 meters deep in some places swamped 75 percent of the capital, which is home to about 9 million people. With poor sanitation and a hot and humid climate, the risk of water-borne diseases is usually a major concern following floods in the city, where mosquito-transmitted malaria is also a threat.